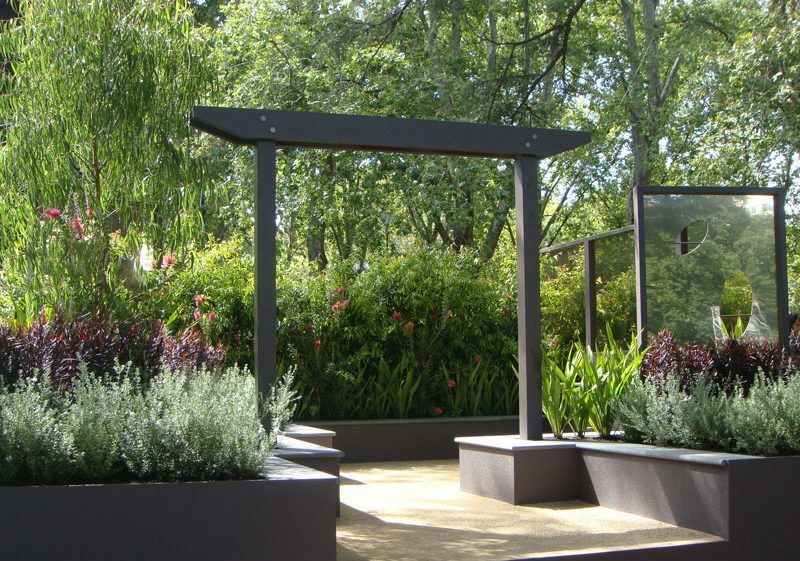 2010 saw Desired Landscapes undertake a garden display at the Melbourne International Flower and Garden Show. The space, designed by our in-house designer, Jenna Mellerick and constructed by Desired Landscapes received acclaim with a bronze garden and first prize award. We were proud of our achievement within the garden show and can now reflect that a show garden does provide one real opprortunity for a designer and crew to really display their core design style and preferences. Without compromise, the designer can select the colours, plants, dimensions and materials that she would choose with a free reign. For Desired Landscapes, this display garden shows our interest in creating spaces that are useable and functional for people -a courtyard area with raised walls provides ample opportunity for seating and the surrounding plants provide a sense of encapsulation within nature. Our surfaces referred to our preference for natural stones, bluestone capping and granitic sand. Following the Garden Show experience and back to real life, we recognise there are so many more considerations within a garden than what can be presented within a display. Desired Landscapes values garden design that matches into architecture and local environments. We work around existing garden features and site considerations (soil, land slope, shade and sun). Our garden design also provides practical solutions to common household concerns around garden privacy, views, and practical placements of barbeques, bins and even the clothesline. We are conscious of budget constraints and client preferences with plants and material choices. A Melbourne International Flower and Garden Show display was great fun and a very exciting time in our business, but we are also very happy to get back to our core work – working with home owners to solve the design issues that exist within real gardens and creating beautiful and enduring outdoor spaces for our clients to enjoy with friends and family. WHAT HAPPENS IN A GARDEN CONSULTATION?